Florida is a state of the southeast United States bordering on the Atlantic Ocean and the Gulf of Mexico. There are many famous Native American tribes who played a part in the history of the state and whose tribal territories and homelands are located in the present day state of Florida. The names of the Florida tribes included the Apalachee, Calusa, Cherokee, Seminoles, Timucuan, Guale, Yamasee, Creek, Miccosukee and Tocobago. The climate, land, history, environment and natural resources that were available to the indigenous Indian tribes in Florida resulted in the adoption of the Southeast culture. Meaning of State name: Spanish for the word 'flowery'. Juan Ponce de Leon called the area "la Florida" in honor of Spain's Easter celebration "Pascua florida" (feast of the flowers). 1513: Juan Ponce de Leon became the first European to explore Florida. He claimed Florida for Spain but was unable to establish a colony due to Indian attacks. 1822: The US government offered land in Oklahoma to the Seminole Indians. Many refused to leave and fought for their lands. 1836: 1836 - 1837 - The Second Creek War (Seminole War). 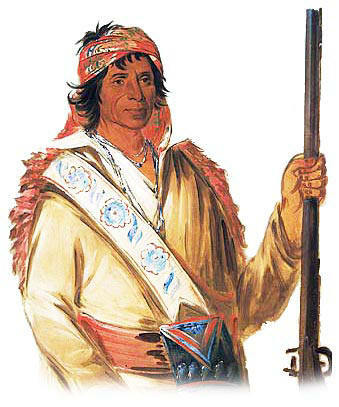 The Seminole Wars killed many of the Indians and forced all but a few out of Florida. The history of the European invasion brought epidemic diseases such as tuberculosis, cholera, influenza, measles and smallpox. The Native Indians of Florida had not developed immunities against these diseases resulting in huge losses in population. Exploitation including the leverage of taxes, enforced labor and enslavement were part of their history, taking their toll on the Florida Indians.